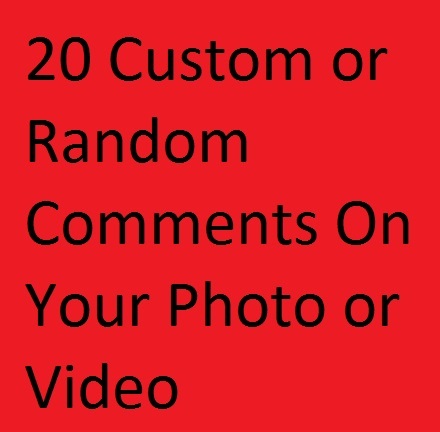 I will give you 20 Custom or random Comments on your photo or videos post very fast only $1. My all comments are comes from active User, Comments are non drop and active. If you need more comments, like, views so please select extra. 100% safe comments for your photo or video????? 100% real and Genuine comments from active user?????? You can get the comments with emoji. 100% real and,Fast Delivery.100% customer satisfaction. NOTE: Please do not order another Seller at the same time for the same page. We cannot give you correct number in that case. Note: After placing order, Cancellation of that order will not be accepted. Don't Make your page private or change the username or Photo removed after placing order. Instant 20 Custom or Random Comments On your photo or video post is ranked 5 out of 5. Based on 12 user reviews.